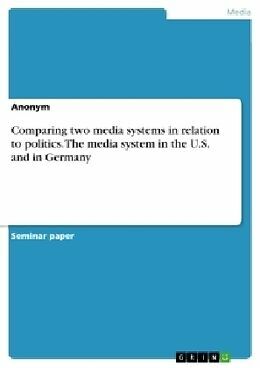 Seminar paper from the year 2013 in the subject Communications - Media and Politics, Politic Communications, grade: 2,1, University of Frankfurt (Main) (Institut für England- & Amerikastudien), course: Media Politics in the United States, language: English, abstract: The purpose of this paper is to discuss the media system of the U.S. and the media system of Germany. In the following, the two media systems are compared in terms of ownership, number, role and regulation. Furthermore, in this paper the link between media and politics will be examined. The last part consists of deducing, which media system serves its citizens best. In the scope of this work it will not be possible to take a look at all forms of media, so this paper will focus on TV. By looking at different countries it becomes clear that every state has its own media system with specific functions, structures and developments. Of course it can be argued, due to the interdependence of the world economy and the European integration that more and more a process of homogenization manifests. But in a media system cultural and political peculiarities still remain. This work serves to point out the similarities and the differences of two different media systems and aims to allude to the interrelations in regard to politics.